Stylish decor mixes with free Wi-Fi and an on-site restaurant at the non-smoking London Edition, situated in the city center. 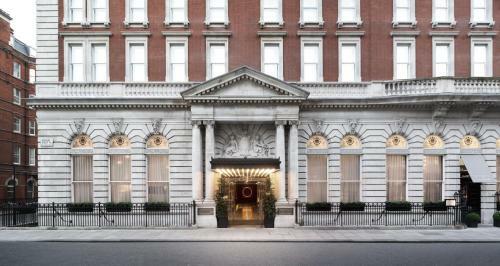 The seven-story London Edition makes a grand first impression via its soaring lobby adorned with carved ceilings and marble columns. The non-smoking hotel's 173 rooms exude warmth, thanks to the wood floors and paneling. In-room amenities include down bedding, free Wi-Fi, 46-inch HDTVs, iPod docks and minibars. Guest stay focused in the business center and work out their stress in the fitness room. Concierge services are available. As for eats, check out the hotel's tavern-style restaurant or indulge with 24-hour room service. Valet parking is offered. In central London, The London Edition puts guests a block from the bus stop and a five-minute walk from the subway. It's within two miles of famous Buckingham Palace, Big Ben and Westminster Abbey. Cultural favorites include the Tate Modern Gallery, three miles away, and the National Gallery, less than a mile away. Check out the crown jewels at the Tower of London, a three-mile ride, or shop the many floors at Harrods, two miles from the hotel. The property is 17 miles from Heathrow Airport. The staff were all extremely helpful. The doormen, waiters/ waitresses, the bar staff, the receptionists..... All of them. BRILLIANT!! The room was perfect for our stay Berners Tavern and the bar area had great atmosphere I cannot fault this hotel!! Amazing building, location. Everything about this hotel is fabulous. The standard of cleanliness is excellent and the condition of the rooms, furniture -everything is excellent. The staff are the real asset here, the attention to detail and attentiveness is outstanding. This is our second visit and we will definitely be back -cannot recommend this hotel and its staff highly enough. Great place to stay, clean, well located and the most incredibly staff. It might be a little pricey but it totally worth! No spa but with the quality of the personnel and installation you will leave feeling relaxed! Chic, love the decor and bar area. Le Labo fragrance is awesome! Didn't like the portrait pictures in the room. Creepy. 1) Reception, bar, and restaurant staff were wonderful. 2) Punch room is amazing! From drinks to staff. 3) Building architecture is wonderful; interior design and decor or reception and restaurant is beautiful. 1) Service can be more personalized beyond the reception. 2) Gym could be better; but hey...no one really used it while I was there. 3) Room sizes in cities like London and New York are generally small, I get that; and they did well with the space (don’t get me wrong) regarding interior design but still could be slightly bigger. 4) Hallways to the rooms were generally quite poor in design - I say this only because the reception area and restaurant set such a high bar for design that the hallways stand out as being below par. 5) Having said this, I am holding this hotel to a high bar because I genuinely like it. I would stay again easily. We got excellent service and the staff arranged a wonderful surprise for my sister on her birthday. Thank you. We’ll come back for sure. Close to transport, restaurants and theatres. Room was spacious and decor was stunning.